Answers to common questions about PHD2 can usually be found in the Troubleshooting section of the PHD2 help or in the PHD2 Best Practices guide. Another good source of information is What to do When PHD Guiding isn’t Push Here Dummy. If you still can’t find the answer to your question you can ask for help in the PHD2 Forum. Be sure to include your PHD2 Log Files in your post. You can either provide the log file as an attachment to your post or use PHD2 to upload the log file: see Automatic Log File Upload in the Help. If you are using an older version of PHD2 you can upload the log to a file sharing service like Dropbox or Google Drive; the logs are located in the PHD2 folder of your Documents folder. When asking for help with a guiding problem, please provide your Guide Log. If you are asking about an equipment connection problem or reporting a bug in PHD2 you should include your Debug Log. Please do not copy and paste a fragment of your log file into your post as we do need to see the whole log file. Select the log files to upload. Use the date and time in the first column to identify the PHD2 session you would like us to look at. 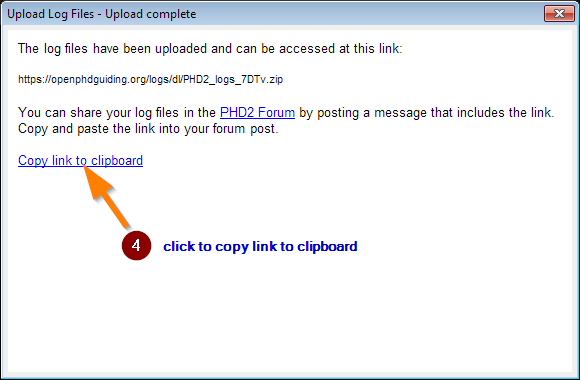 Compose your message in the PHD2 Forum and paste the log file link into the message (Ctrl-V). Please include any additional detail that you think might help us help you. For example, let us know the approximate time of the problem so we know where to start looking in the log. The logs will show us everything that PHD2 was doing and any errors that occurred, but there are other aspects of your setup that may be relevant that are not included in the log.